An outstanding examination of Keating’s life as an artist, teacher, broadcaster, and public commentator. Based on extensive research and previously unavailable archival material, it is the first ever full-scale work on the artist, richly illustrated in colour. Categories: Art, Biography / Memoir. Seán Keating: Art, Politics and Building the Irish Nation is an outstanding examination of Keating’s seventy-year working life as an artist, art teacher, broadcaster, and public commentator. Based on extensive research and previously unavailable archival material, it is the first ever full-scale work on one of Ireland’s most well known yet controversial artists, richly illustrated in colour. Offering a comprehensive and well-balanced portrait, and revealing previously unknown insights into his life, O’Connor discusses his difficulties at the Dublin Metropolitan School of Art, the networks of people he knew – Harry Clarke, William Orpen, Robert Flaherty, Micheál MacLiammóir – the projects he engaged with, and his sometimes self-destructive relationships with those whom he could not respect. This ground-breaking study explores Keating’s expansive career, from his overtly political paintings of the War of Independence, to the artist’s engagement with the Aran Islands and his recording of the industrialisation of the new state, but also his controversial articles and broadcasts in the 1930-40s. 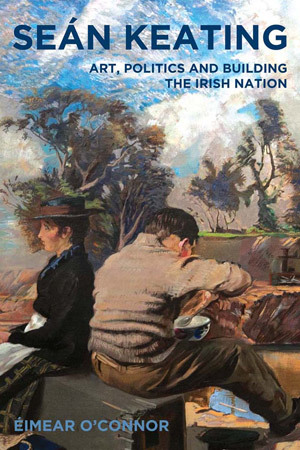 Richly illustrated with over 200 colour paintings, sketches, photographs, Seán Keating: Art Politics and Building the Irish Nation will be the definitive work on this hugely respected yet controversial Irish artist for years to come. Majestic and authoritative portrait of Sean Keating’s seventy year working life as an artist, broadcaster, & public commentator. Richly illustrated in colour with over 200 paintings, sketches, and photographs, many previously unpublished. Éimear O’Connor is Research Associate with TRIARC-Irish Art Research Centre, Trinity College Dublin. She is the author of Seán Keating in Context: Responses to Culture and Politics in Post-Civil War Ireland (2009) and Editor of Irish Women Artists 1800-2009: Familiar but Unknown (2010).